If you’re looking for unusual wedding venues in Kent for your big day, these spots need to be on your radar. Are you on the hunt for unusual wedding venues in Kent? Lucky for you, the county known as 'The Garden of England' has a ton of amazing locations up for grabs. Whether you’re festival goers, beachers, foodies or gardeners, there’s a spot that’s sure to fit your vision perfectly. We’ve rounded up our favourites to help you on your journey to find your dream destination. Here are unusual wedding venues in Kent for every type of couple. Love the idea of turning your wedding into an event like Bestival or Parklife? We do, too! Unfortunately, you probably won’t be able to book the same artists for your big day, but you can mimic the atmosphere by choosing an unusual wedding venue in Kent like Preston Court for your festival wedding. Its grounds feature picturesque forests, a lake, a georgian mansion, a 500 year old barn (perfect setting for your reception) and a vintage carousel. You and your guests can even stay the night in its collection of Bell Tents. It can accommodate groups of up to 400, so you shouldn’t have to cut back your guest list. If you’re looking for a castle wedding venue in Kent that’ll make you and your partner feel like monarchs for a minute, head to Whitstable Castle Trust for your special day. Its history dates back to the 16th century and while it still has a medieval vibe, it’s been polished and updated with the necessary 21st fixings (you know, like electricity). Inside you’ll find oak panelling, crystal chandeliers, grand fireplaces and more. It can fit up to 90 guests in its largest space, so you’ll want to keep your guest list short. East Quay Venue is the perfect place for those who love the sea to say their vows. The building was originally the oyster grading room of the Seasalter and Ham Fishery Company and is located right on the water’s edge, so, naturally, it has amazing views of the water and pebbled beach. Its interior flaunts exposed brick walls, wooden beam ceilings and concrete floors, giving it a lofty, rustic-chic style. The space can accommodate up to 100 guests, making it best suited for smaller weddings. If you and your partner love glitz, glamour and the finer things in life, Cobham Hall may be the wedding venue in Kent for you. The tudor country house is located on the beautiful 50 acre estate, giving you plenty of privacy for your party. It has both indoor and outdoor spaces available for civil ceremonies and receptions, including a lavish ballroom with ornately carved ceilings, glowing chandeliers and oil painted portraits. The space can fit up to 120 guests, so you don’t want to go overboard with your invites. Give your big day some serious flower power by bringing your garden wedding to the Orangery Maidstone. The building is surrounded by nine acres of landscaped gardens and has its very own lake and waterfall. Inside is just as stunning, with floor-to-ceiling windows and elegant decor. It can accommodate groups of up to 250 guests, making it ideal for midsize to large weddings. Turner Contemporary is the perfect venue for couples who want to give their wedding an artistic edge. The David Chipperfield designed building is one of the most prestigious galleries in the country and is stylish enough inside that you won’t have to go overboard buying or renting decor. It can fit up to 200 of your nearest and dearest (and their plus ones). Who doesn’t love a barn wedding venue? Inject your big day with some rustic chic flair by bringing it to Odo’s Barn. 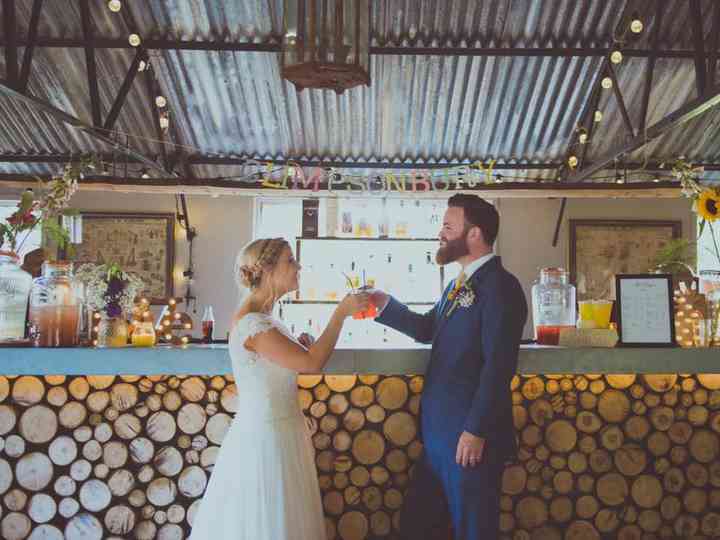 This unusual wedding venue in Kent has everything you could ever want for your ceremony and reception - exposed beams, polished wooden floors and picturesque woodland surroundings (perfect for wedding photos). This Pinterest-worthy spot can accommodate up to 120 guests, so maybe stick to inviting your close friends and family and skip the acquaintances. There’s no shortage of stunning vintage-style wedding venues in Kent, and Charlton Park is one of its finest. The historic mansion has both indoor and outdoor venue options, making it perfect for any season. Its interior is impeccably decorated with newly finished floors, high ceilings and old timey decor and can be made over to suit just about any theme. It can fit up to 350 guests, so you can go ahead and invite all of your friends, family and followers. One Warwick Park looks like the flat you’ve always wanted, but could never afford. The event room has exposed brick walls, a cathedral ceiling with visible wooden beams and massive arched windows (basically, it’s one of the dreamiest spots in town). It’s pretty much a blank slate when it comes to decor, so you can spruce it up with all the floral arrangements, fairy lights and bunting banners you want. It can fit up to 120 seated guests, making it ideal for a more intimate wedding breakfast. Have you been oohing and ahhing over photos of woodland weddings? Well, it may be time to book The Dreys. This unusual wedding venue in Kent is nestled among 80 acres of beautiful private woodland, giving you plenty of space for your ceremony and reception. On your big day you’ll have full use of the property, including the field shelter and marquee. It can accommodate small wedding and groups of up to 500 guests, so you’ve got plenty of options.